For the first time, Dibrugarh is all set host seven-day 20th Bharat Rang Mahotsav, the international Theatre Festival of India, organised by National School of Drama(NSD) in collaboration with India Club Theatrical Institution from February 4 to 10, 2019 here. 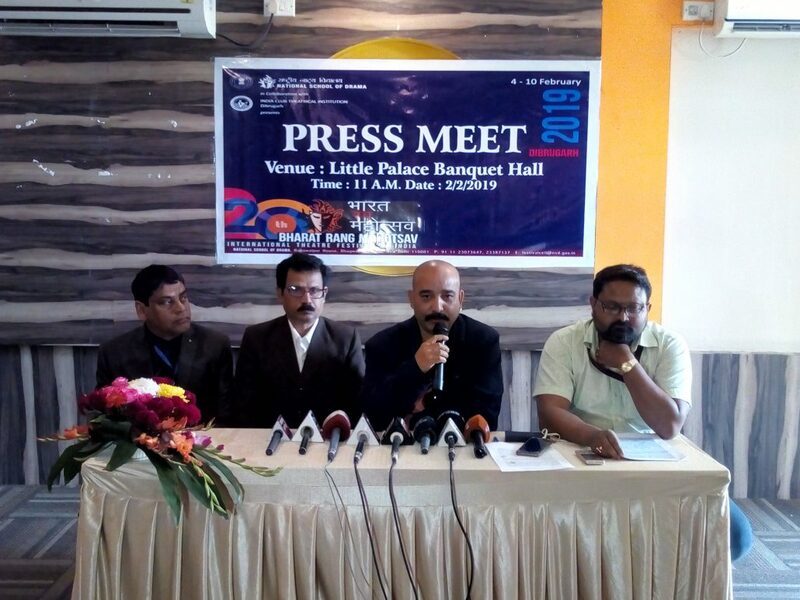 Addressing a press conference here, Ashim Kumar Sharma, chief coordinator of the Bharat Rang Mahotsav, informed that on February 4, the the festival will be inaugurated at India Club Theatrical Institution by chief guest and former president of Asom Sahitya Sabha, Dr Nagen Saikia. He said the Mahotsav is organised by NSD, one of the foremost theatre training institutions in the world, in collaboration with India Club Theatrical Institution, Dibrugarh. “For the first time Dibrugarh audience will get a chance to witness seven plays including three international productions from Bangladesh, Poland and Sri Lanka. During the allied activities, theatre enthusiasts and students will be able to engage in interactive session with Bharat Sharma, a renowned choreographer,” Sharma said. In the inaugural ceremony, an Assamese play ‘Bhou’ based on Assam agitation written and directed by Pranjal Kumar Saikia will be staged. Three international dramas are ‘Zemsta’ (Revenge), a Polish drama written by Aleksandar Fredro and directed by Henryk Talar, ‘King Oedipus’, a Bangladeshi drama written by KR Meera and directed by Hazim Amaravila, ‘My Sweet Rotten Heritance’, a Sri Lankan drama written and directed by Anasuya Subasinghe in English language will be performed during the seven-day festival. “We are fortunate to host the BRM in India Club Theatrical institution here. We urge all the theatre lovers people of Dibrugarh to come and enjoy the seven days international festival,” said Partha Bhattacharya, cultural festival of India Club Theatrical institution. The other Indian dramas are ‘Veendum Bhagavante Maranam’, ‘Bubbles in the River’ and ‘Shuka’. “Theatre is a part of our life and yet we struggle to appreciate it. I am happy that this festival gives us a chance to witness many of the plays which have received critical acclaim globally. We want more and more people , especially the youth, to enjoy the festival and hence, we have spread it across the country,” said Bipul Borkakoti, technical director of BMS. BMS, organised by NSD, was established two decades ago to stimulate the growth and development of theatre across India. BRM has evolve to international scope, hosting theatre groups from around the world, and is now the largest theatre festival of Asia. “Till date, BRM was celebrated in New Delhi and has travelled to several cities in India, presenting an overwhelming 1787 plays, and riveted thousands of audiences who basked in the glory of heart-winning stories and superior performances,” said Borkakoti. The 20th Bharat Rang Mahotsav also holds parallel festival in other cities including Dibrugarh, Varanasi, Ranchi, Mysore and Gujarat.